When I came to the Maryland Institute to teach photography in the late 1960s I was told that the Institute had been teaching photography for about a decade. In 1976 while researching the Institute for an exhibition on stereo photography in the Maryland Historical Society Library I was surprised to discover references to the teaching of photography in the 19th century. This led me to search further for information on what seemed to be a little understood aspect of the Institute's history. The Maryland Institute was established in 1826 as the Maryland Institute for the Promotion of Mechanical Arts. It was patterned on the Franklin Institute of Philadelphia which had been organized in 1824. The first permanent home of the Institute was the Athenaeum at the corner of Lexington and St. Paul streets in Baltimore. Here it conducted scientific courses and general lectures and established a fine library. The Institute continued at this location until February 7, 1835 when the Athenaeum and all the Institute's property were destroyed by fire. 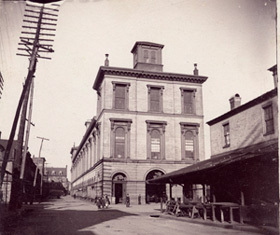 Sixteen years later in 1851 reorganization was completed and a new home for the Maryland Institute was erected on Market Place at Baltimore Street and Marsh Market. The Market Place building became the home of the school in 1852. Its great Exhibition Hall, said to be the largest clear space in America could seat four thousand people. In this great hall the Maryland Institute held an annual Exhibition of the Mechanical and Fine Arts and awarded medals in Painting, Drawing, Sculpture, Printmaking, and Photography. The catalogs of the Maryland Institute Exhibition list in detail the exhibitors and awards given. The daguerreotypist Charles Fontayne and William Southgate Porter gained fame when they exhibited an eight whole-plate panorama of Cincinnati at the Franklin Institute, the Maryland Institute, and the Great Exhibition in London. The great hall was not only an artistic and cultural center but also the site of the national conventions of political parties. Four presidential candidates including Franklin Pierce and Millard Fillmore were nominated in the hall. In 1852 the newly reorganized and revitalized Maryland Institute engaged an Instructor of Drawing, David Acheson Woodward. Woodward was born in Philadelphia in 1823 and moved with his family to Cincinnati, Ohio were he showed a strong interest in Art. He opened portrait painting studios in Cincinnati and then Philadelphia. He studied painting at the Pennsylvania Academy and traveled and painted in the United States until 1847 when he moved to Baltimore. He established a painting studio on the corner of North and Fayette streets. In 1851 he married Josephine Laty, the daughter of a Baltimore shipbuilder. They had five sons and two daughters. In 1853 Woodward was elected Principle of the Drawing Department at the Institute and continued in that position until 1860 when he was elected by the board to be the leader in reorganizing the school. The result was a new School of Art and Design of which he was chosen Principal. He held that position until about 1879. The Maryland Institute's Twenty-Ninth Annual Report of April 1877 speaks candidly of financial and enrollment problems. The Annual Exhibition was not held, salaries were reduced, departmental appropriations were reduced, and some departments were discontinued. The report states "...great depression still exists in all branches of Commercial and Mechanical industry...". Cover illustrations from Maryland Institute Schottisch, 19th century sheet music, showing the exterior of the Market Place home of the Institute. This undated photograph shows the back of the Market Place home of the Institute before the 1904 fire. Woodward continues to be listed at the Maryland Institute in Wood's Baltimore City Directory until 1879. Thereafter he is listed as an artist with a studio at 74 N. Charles and later 99 N. Charles. No further mention is made of Woodward in the annual reports of the Institute in the 1880s. Professor Woodward was associated with the Institute for twenty-seven years. For nineteen of those years he was Principal of the Schools of Art and Design. His tenure was a period of innovation, technological advancement, and the development of a pioneering curriculum in the teaching of photography. In 1857 Woodward patented the first widely successful photographic enlarging camera. He continued to make improvements to his solar camera in a series of patent renewals in the 1860s and 1870s. He became internationally recognized for his invention and in 1876 he was given an award at the Philadelphia Centennial Exposition. In the 1878 book How to Paint Photographs in our collection there is an ad for the Improved Solar Cameras by D.A. Woodward, Maryland Institute, Baltimore, Md. An advertisement for Woodward's Solar Cameras from the 1878 book How to Paint Photographs showing a medal awarded at the 1876 Centennial Exhibition. These cameras were usually mounted on a studio roof and were designed to turn to follow the sun. They were large, heavy devices that used condensers to focus the light from the sun and a copying lens that projected a small negative onto a large sheet of sensitized photographic paper or canvas. The solar camera came in two sizes, half plate with nine inch condenser, and quarter plate with a five inch condenser. Woodward as a portrait painter was interested in making enlarged copies of photographs on canvas to paint over. Using this camera he could print life-sized portraits (18"X22") from a half plate negative in about forty-five minutes. In 1859 Woodward went to Europe to publicize his invention. While there he demonstrated the solar camera for Antoine Claudet in London. Claudet said it was "...one of the most important improvements introduced into the art of photography." Claudet helped in its successful introduction in Europe in 1860. The 1876 Maryland Institute Annual Report mentions the commissioning of a Woodward painting of the late Johns Hopkins. It states "...the portrait -- and elegant life-size -- now adorns the main entrance hall." Baltimore photographer David Bachrach claims to have made over two-thousand photo portraits using the solar camera during this period. In an article "Mayall's Life-Size Portrait of George Peabody" in History of Photography, October-December 1985 noted historian Larry Schaaf describes a portrait now in the Peabody Institute of Johns Hopkins University. It is a portrait enlarged from a carte de visite by photographer Mayall in 1866, enlarged 30 to 40 times using a Woodward solar enlarger. The final enlargement was painted over by A. Armoult. This is an important example of the technique since much of Woodward's work was destroyed in the Baltimore fire of 1904. Many solar enlargments, often with so much overpained that little photographic detail is left, were made at the end of the 19th century through the early 20th century. They are also called crayon portraits. A painted solar enlargement from a photographer's sampler - also called a "Crayon Portrait"
As the Principal of the Schools of Art and Design Professor Woodward was a pioneer in the field of formal photographic education. His strong interest in technology and the art of photography are reflected in the inclusion of photography in the curriculum of the Institute during his tenure. Day school courses included "Tinting and Coloring Photographs in Water and Oil and Indian Ink" and "Photography, including the use of the various kinds of Cameras and Apparatus used in the business." In 1876 the tuition fee for Photography was Females -- $15.00 and Males -- $20.00 while the fee for Oil Painting was Females -- $8.00 and Males -- $10.00. 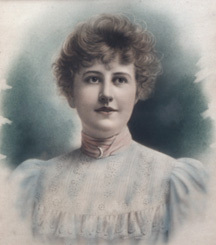 The Maryland Institute had one of the first formal photographic programs under Woodward's direction. Such programs were very rare in the 19th century. When Woodward left the Institute in 1879 all photographic courses disappeared from the curriculum. This could have been caused by the removal of Woodward's influence or by the effect of budget cutting in tough times since the photography classes were more expensive than painting. With the end of Woodward's era photography courses did not reappear at the Institute till the middle of the 20th century. 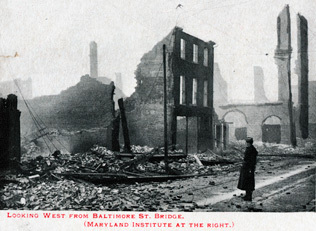 On February 7, 1904, the anniversary of the 1835 fire, the Market Place home of the Maryland Institute was destroyed in the Great Baltimore Fire. The Great Hall, the fine library, and Woodward's life-size portrait of Johns Hopkins were now gone. The spirit of the Maryland Institute survived and classes resumed in temporary quarters two days after the fire. Through an appropriation by the Maryland legislature, a gift from Andrew Carnegie, and donated land from Michael Jenkins the Maryland Institute built a new permanent home at 1300 Mount Royal Avenue. Construction began in October 1905 and the first class was held in October 1907. The present Main Building was dedicated in 1908. The lower level of the main building has housed the Photography Department since the mid-20th century. In a tribute to his contribution to photography the exhibition space in the department was called the Woodward Gallery until 2009. I feel that we should offer special thanks to David Woodward for his pioneering efforts in photographic education and his technological advancement of photography.